BR Page 10: FR, LMS, BR, Sealink etc. 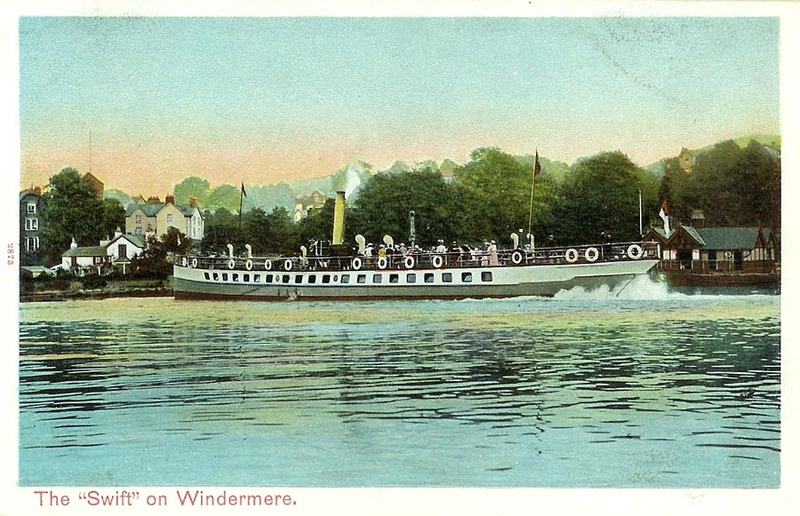 This page is devoted to postcards and photographs of the Lake Windermere services of British Railways, and its predecessors the London, Midland & Scottish Railways (LMS) and Furness Railway (FR). Services were privatised out of railway control in 1984. 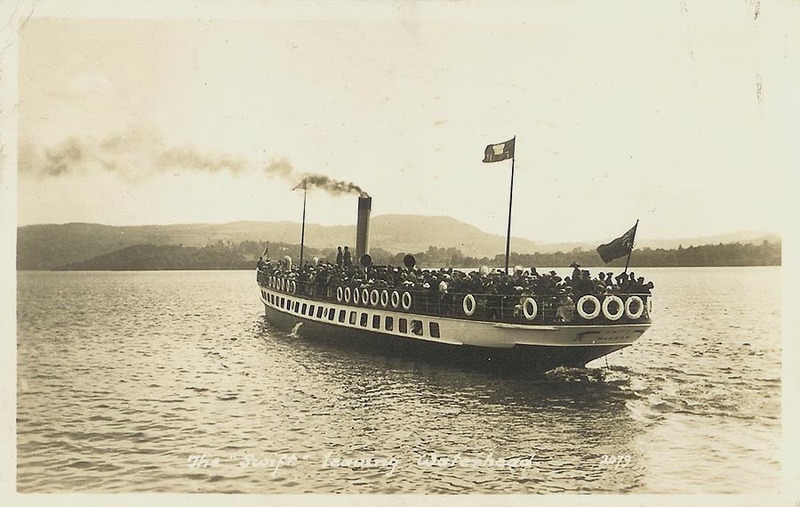 The first steamboat to built for an English lake was the wooden Lady of the Lake of 1845. She was operated by the Windermere Steam Yacht Company, sailing from Newby Bridge, on the River Leven, to Ambleside, a distance of eleven miles which she covered in about an hour and a quarter. 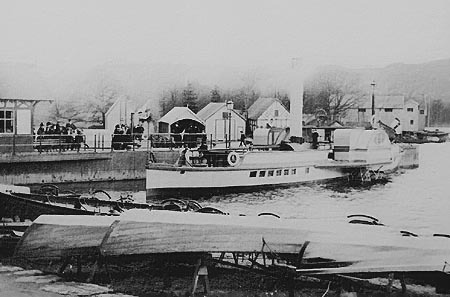 The competing passage boats took over three hours, and were soon put out of business. 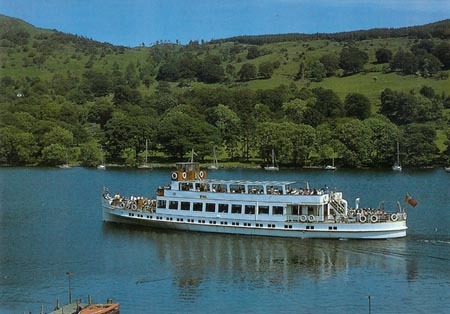 Such was the success of Lady of the Lake in her first year, that a second steamer was ordered, the Lord of the Isles. 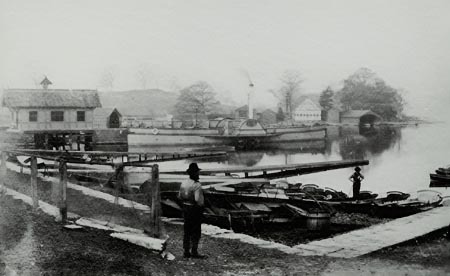 She was launched at Newby Bridge in 1846. 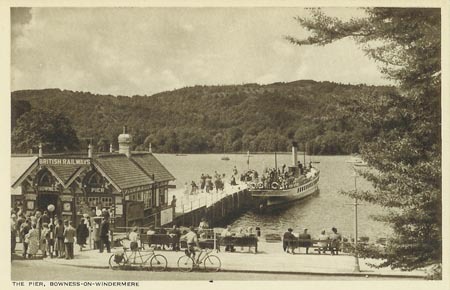 A year later, the railway to Windermere was opened, and tourist numbers increased dramatically. Rivals soon appeared, in the form of the Fire Fly and Dragon Fly of the Windermere Iron Steamboat Company (a name re-activated when the railway services were privatised in the 1980s). The two rival companies operated a joint service from 1856, and combined as the Windermere United Steam Yacht Company in 1858. 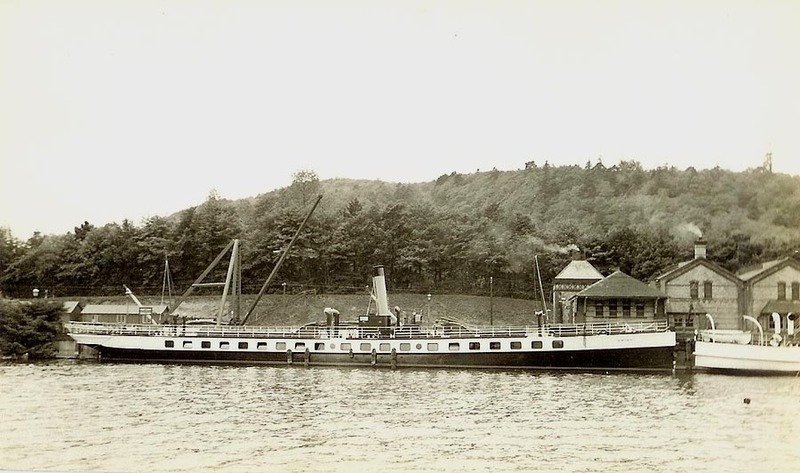 A much larger iron steamer, the Rothay, was introduced in 1866, joining the Fire Fly and Dragon Fly in service. 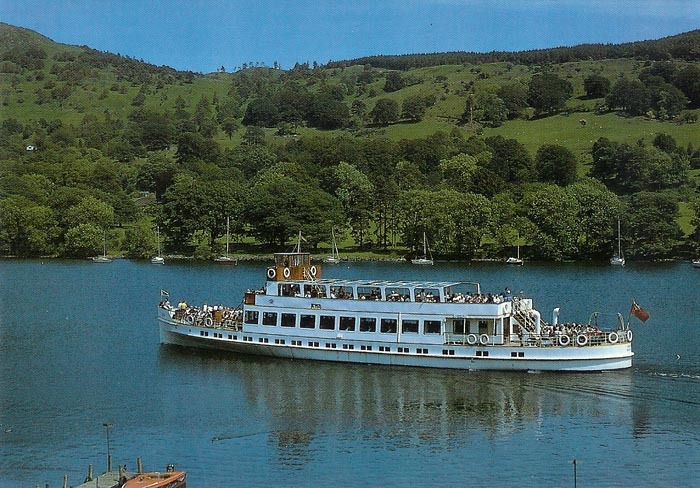 Lady of the Lake had been withdrawn in the early 1860s, and Lord of the Isles had been burnt out in 1850. 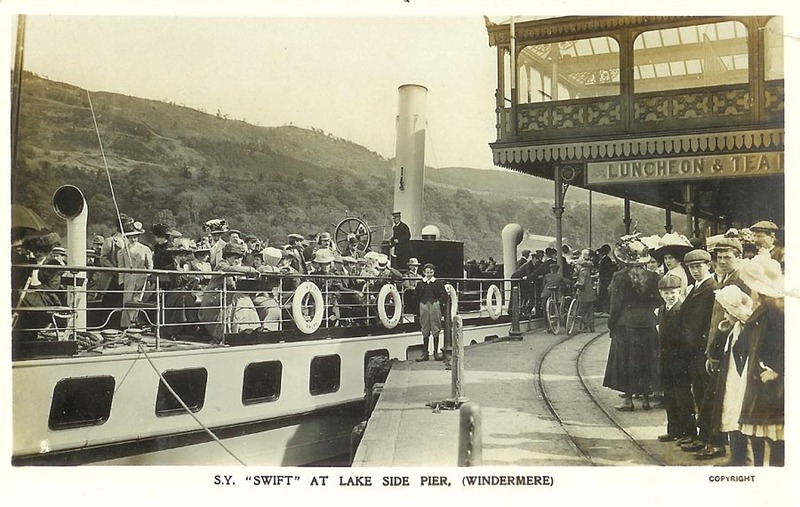 In the same year, 1866, the Furness Railway commenced construction of the Lakeside branch (now a preserved steam railway) and took control of the United Steam Yacht Company. 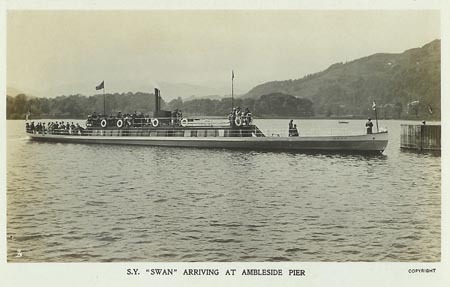 The Lakeside branch opened in 1869, and a large screw steamer, the Swan (1) was delivered the same year. 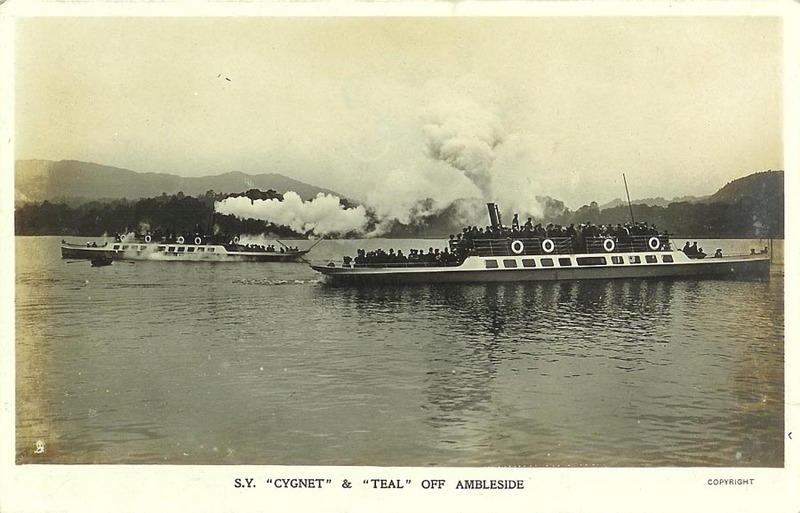 Two smaller steamers followed in 1879, the Cygnet and Teal (1). These were followed by the elegant Tern in 1891, which is still in service. The last paddle steamer, Rothay was replaced by the Swift in 1900. 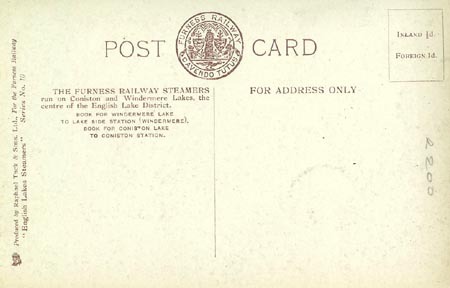 The Furness Railway always flew the White Ensign, clearly visible in some of the cards below. The Admiralty only exercised jurisdiction over the high seas, so technically the Furness Railway were allowed to do this, and they continued to do so despite polite requests to desist from the Admiralty. 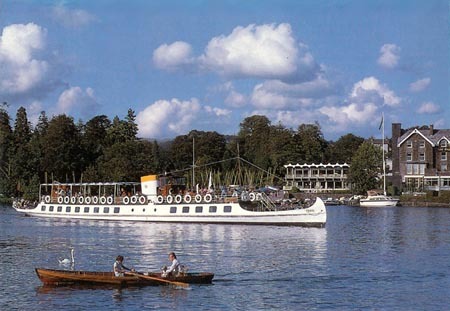 Ownership passed to the LMS in 1923, and they built two large motorships, Swan (2) and Teal (2), in 1936. 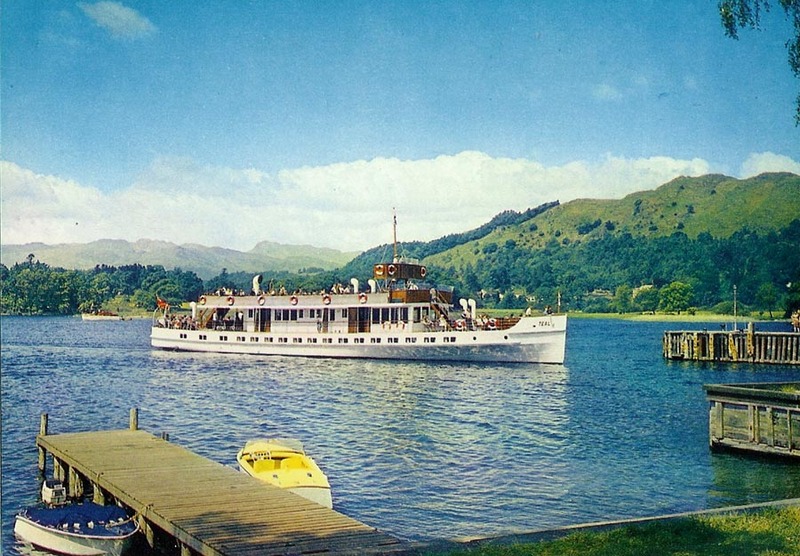 Photographs from LMS days show the steamers flying the Red Ensign. 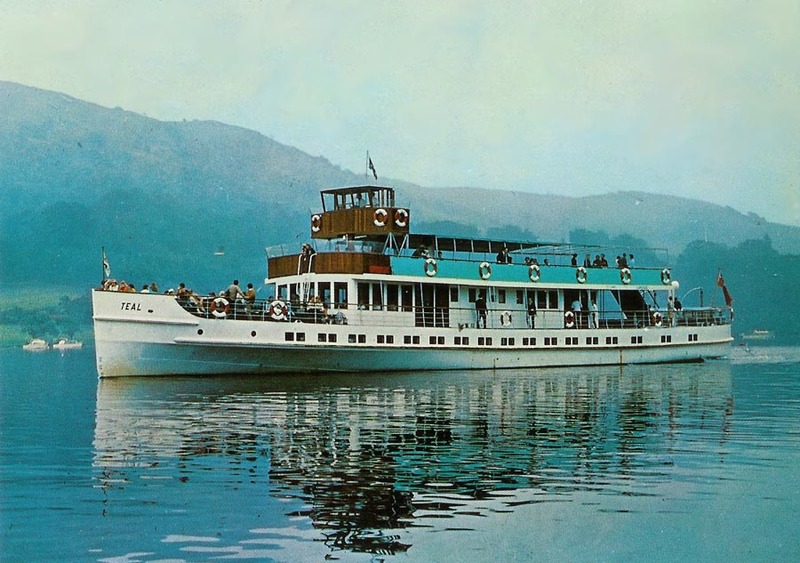 Teal (1) was withdrawn in 1927, but the rest of the fleet passed to British Railways in 1948, later becoming Sealink. Sealink was privatised in 1984, being taken over by Sea Containers. 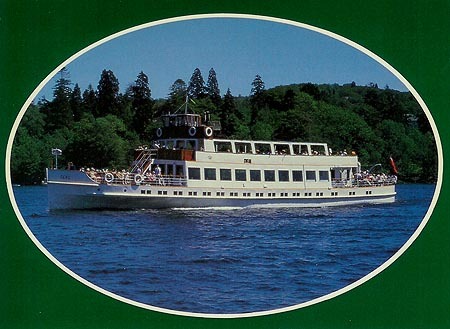 Services in 1985 were still marketed as part of Sealink, using a new italic font. In 1986, the name Windermere Iron Steamboat Company was revived for the separated Windermere services, with "Established 1848" prominent in the logo. 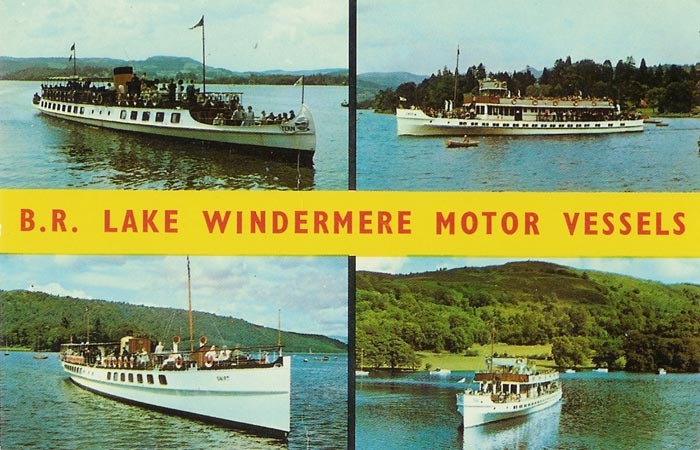 There was indeed a common link from this original company through to the 1986 incarnation via the Furness Railway, LMS and British Railways/Sealink. However, the timetables also used the title Windermere Lake Cruises, and this eventually became the company name. 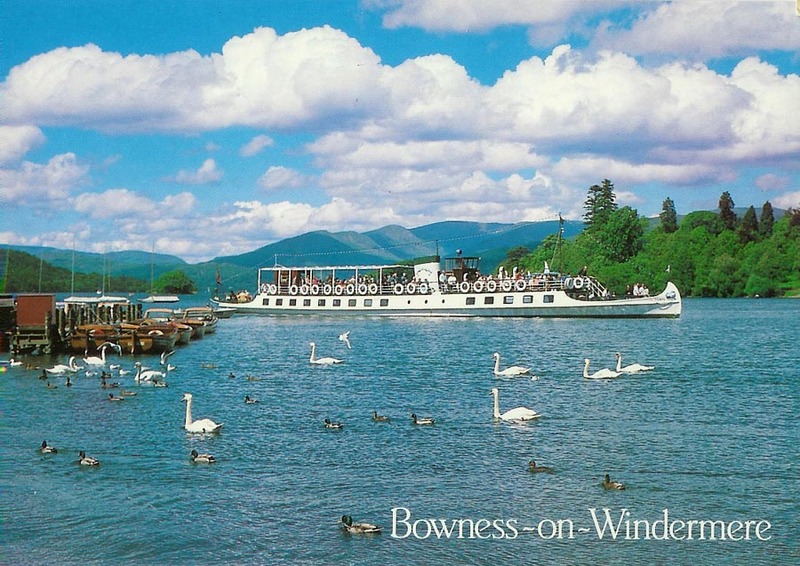 From 1993, joint timetables under this title were issued with the Bowness Bay Boating Company, who have operated smaller boats on the lake for many years, in competition with the railways. For some years both company titles (Windermere Iron Steamboat and Bowness Bay Boating) appeared together with their separate addresses in Lakeside and Bowness. 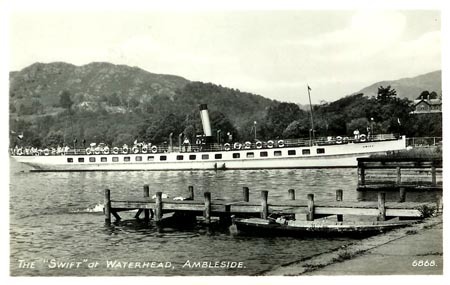 The separate company names eventually disappeared from publicity, and from 2002 there was a new combined headquarters in Ambleside. My thanks to Anthony Langford for allowing his cards to be used on this page. British Railways/Sealink - Page 2 - Heysham Services - to be completed! The first steamboat to built for an English lake was the wooden Lady of the Lake of 1845. 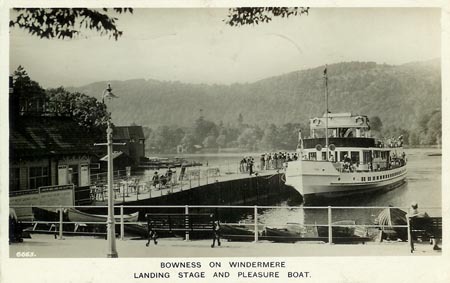 She was operated by the Windermere Steam Yacht Company, sailing from Newby Bridge, on the River Leven, to Ambleside, a distance of eleven miles which she covered in about an hour and a quarter. 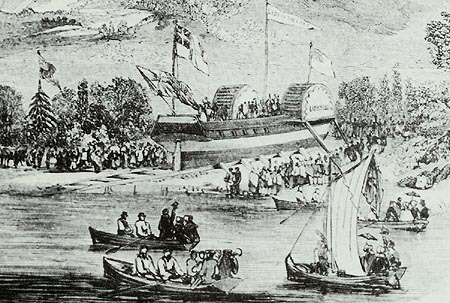 The competing passage boats took over three hours, and were soon put out of business. Such was the success of Lady of the Lake in her first year, that a second steamer was ordered, the Lord of the Isles. 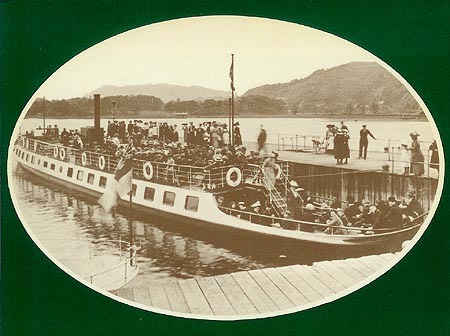 Lady of the Lake was withdrawn in the early 1860s. 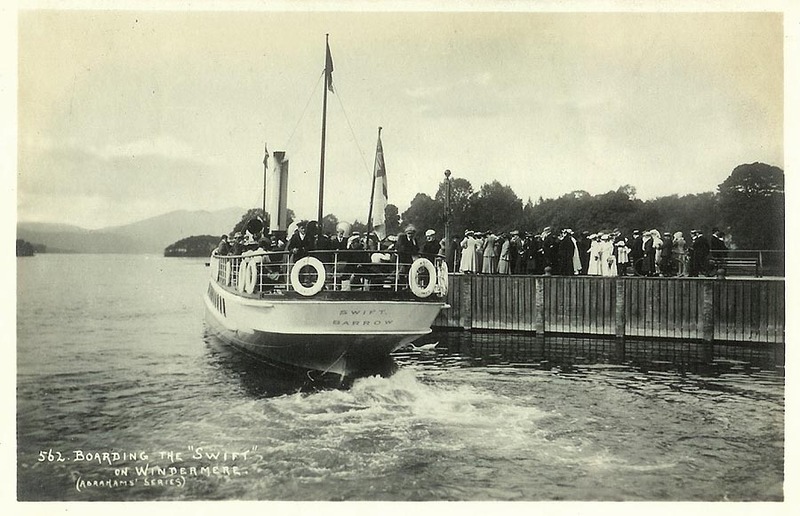 Illustration of Lady of the Lake being launched. Photograph of Lady of the Lake. 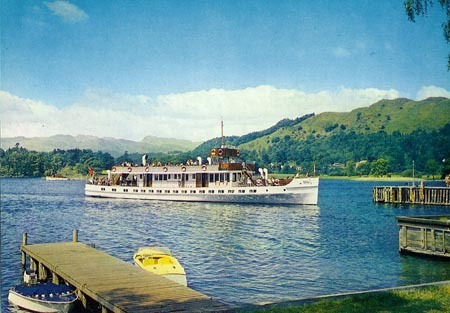 Photograph of Lady of the Lake (left) and burnt out Lord of the Isles. 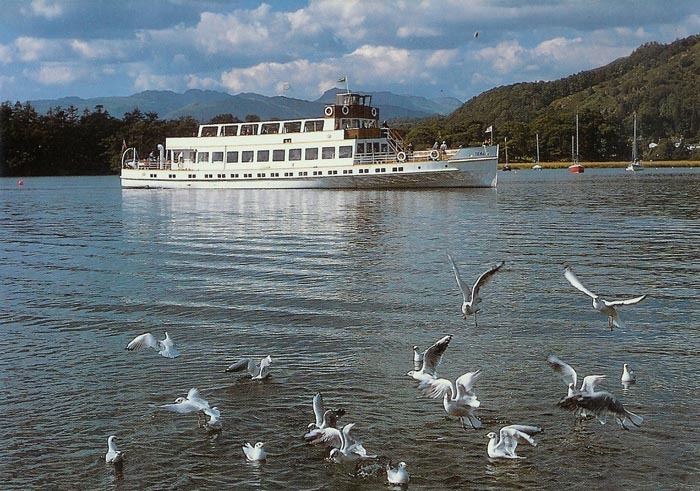 Such was the success of Lady of the Lake in her first year, that a second steamer was ordered, the Lord of the Isles. 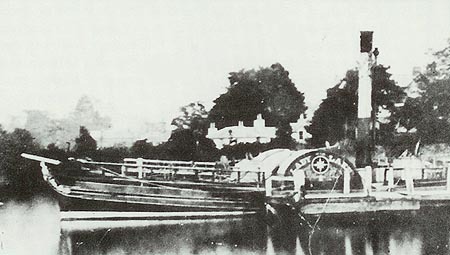 She was launched at Newby Bridge in 1846. Her career was short, since she was burnt out in 1850. 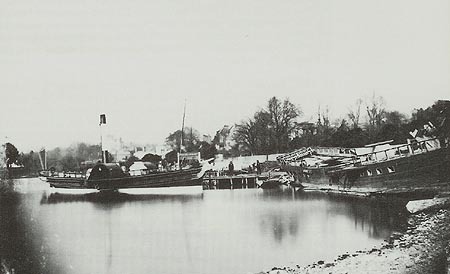 Photograph of Lady of the Lake and burnt out Lord of the Isles (right). Rivals to the Windermere Iron Steam Yacht Company soon appeared, in the form of the Fire Fly and Dragon Fly of the Windermere Iron Steamboat Company (a name re-activated when the railway services were privatised in the 1980s). 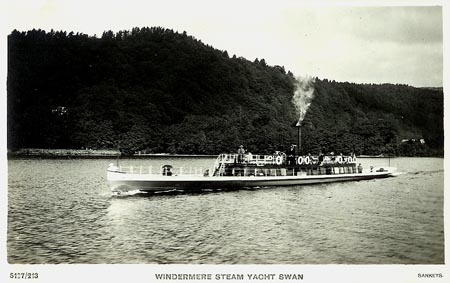 The two rival companies operated a joint service from 1856, and combined as the Windermere United Steam Yacht Company in 1858. 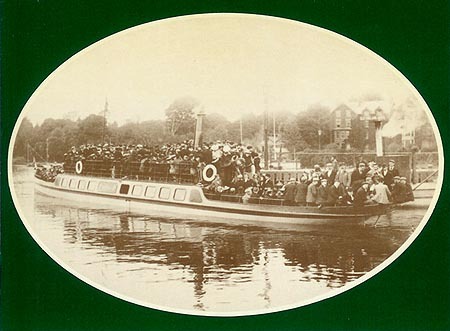 A much larger iron steamer, the Rothay, was introduced in 1866, joining the Fire Fly and Dragon Fly in service. Lady of the Lake had been withdrawn in the early 1860s, and Lord of the Isles had been burnt out in 1850. 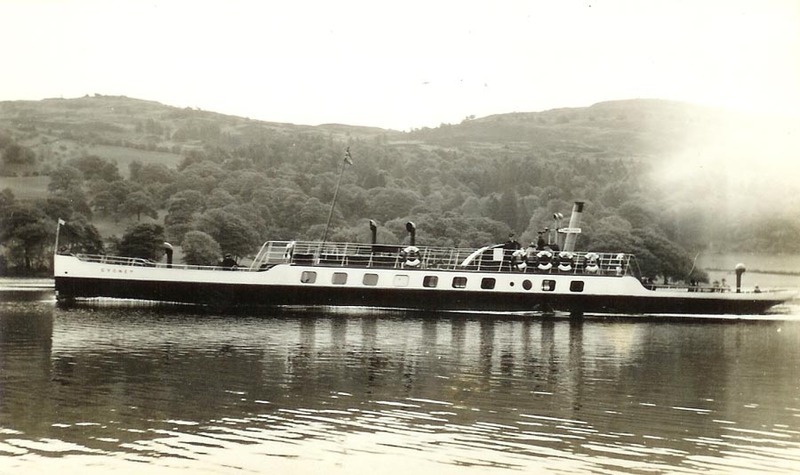 Rothay was double-ended to allow easy access to her berth in the river at Newby Bridge. 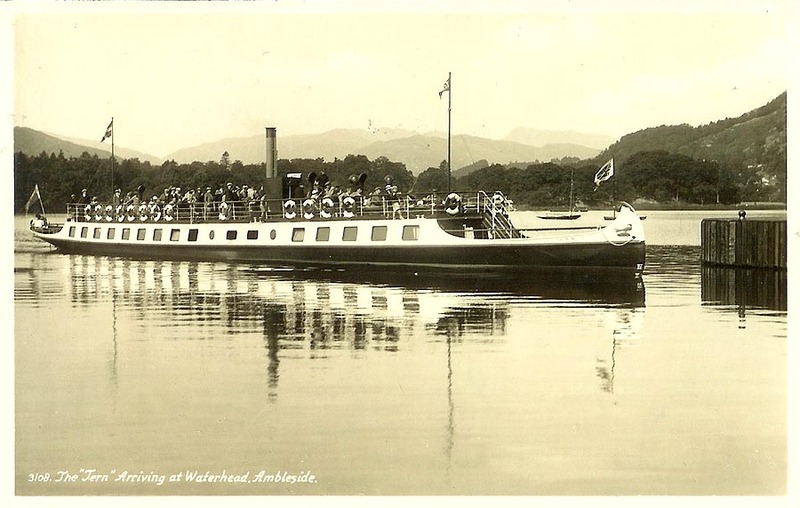 The last paddle steamer in service, Rothay was replaced by the Swift in 1900. 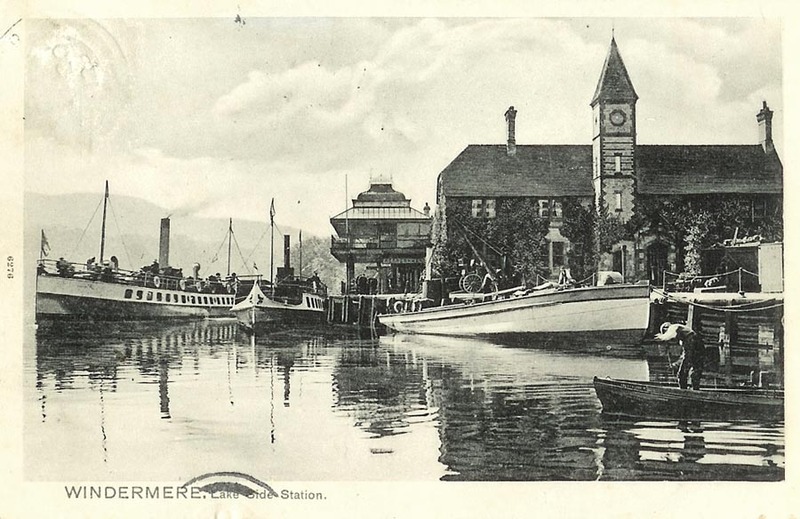 In 1866, the Furness Railway commenced construction of the Lakeside branch (now a preserved steam railway) and took control of the United Steam Yacht Company. 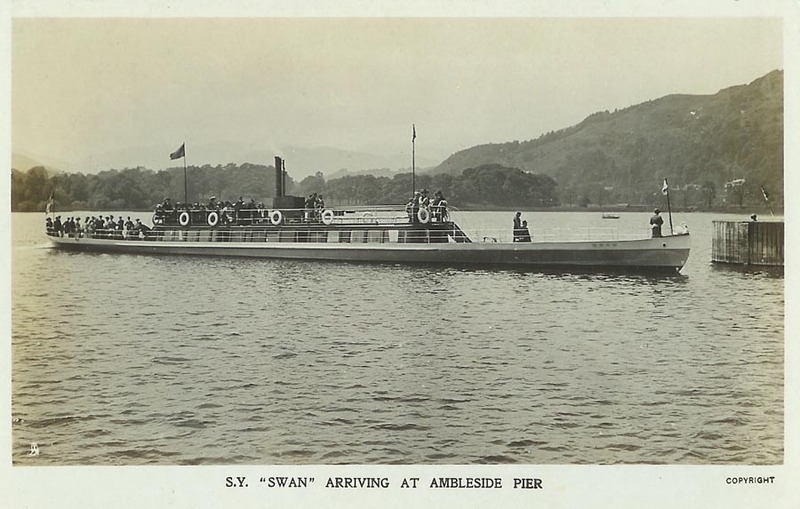 The Lakeside branch opened in 1869, and a large screw steamer, the Swan (1) was delivered the same year. 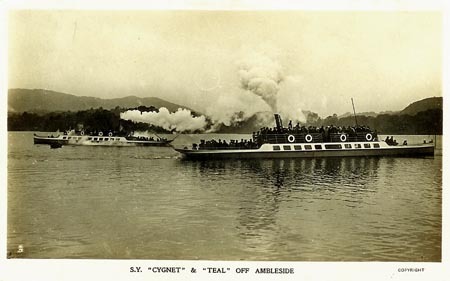 Two smaller steamers followed in 1879, the Cygnet and Teal (1). 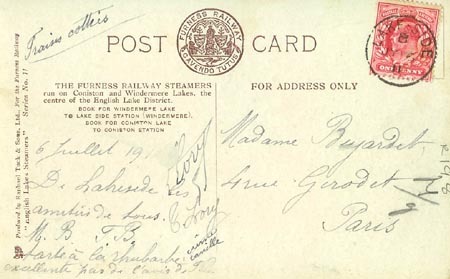 They all passed to the LMS in 1923. 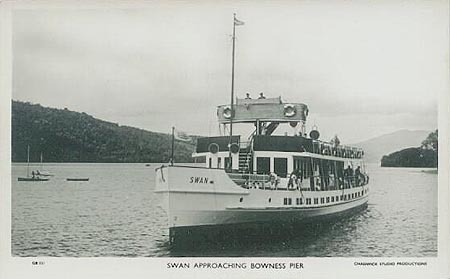 Swan (1) was scrapped by the LMS in 1938. 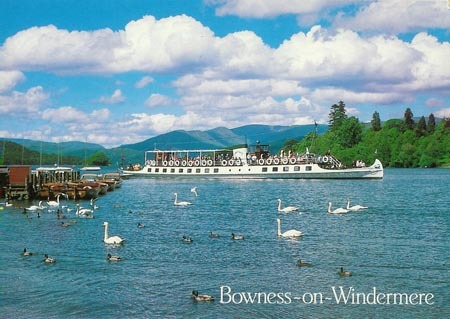 Furness Railway postcard of Swan (1) (Series 10). 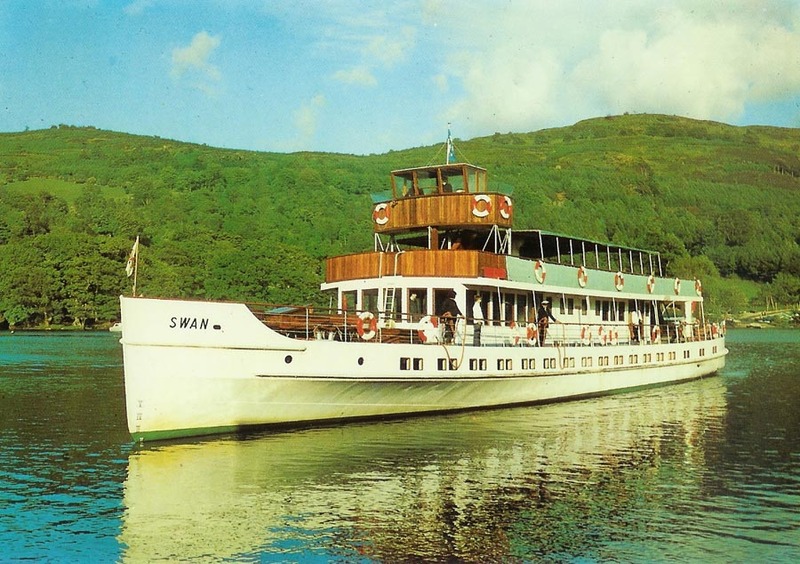 Sankeys postcard of Swan (1). 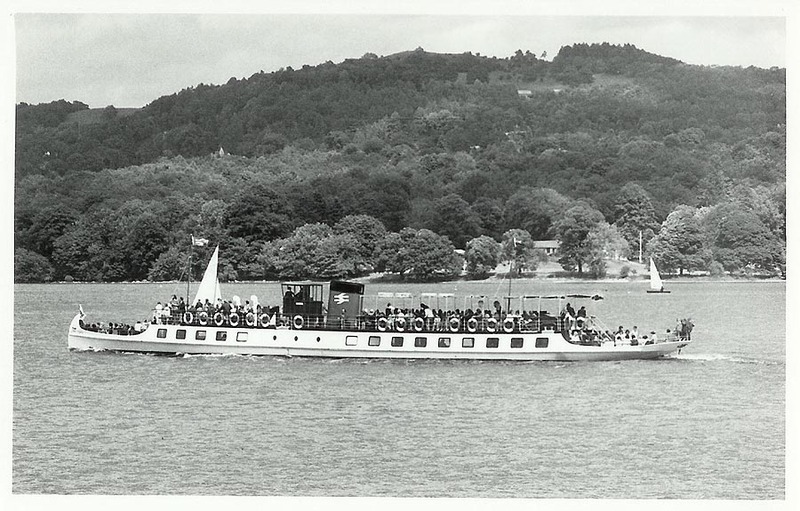 Raven was used by the Furness Railway to carry cargo and supplies around the lake. 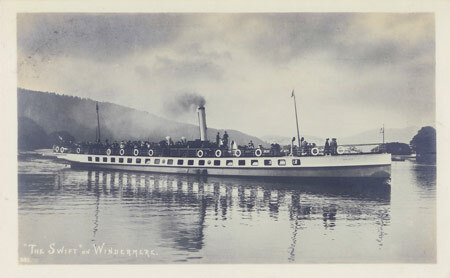 She was restored at the Windermere Steamboat Museum. 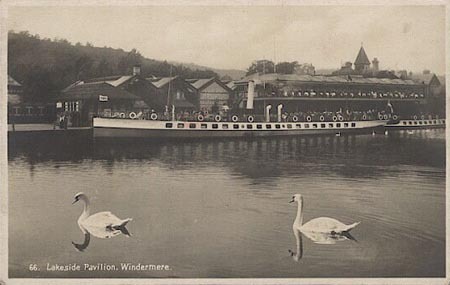 Postcard of Swift, Tern and Raven at Lakeside. Postcard of Raven after restoration. 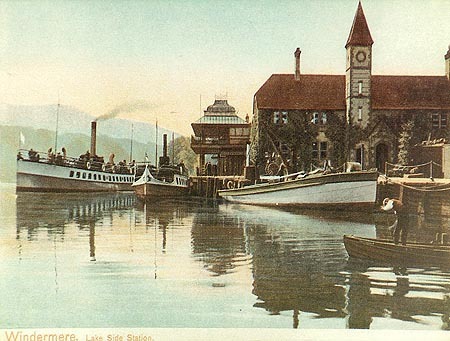 In 1866, the Furness Railway commenced construction of the Lakeside branch (now a preserved steam railway) and took control of the United Steam Yacht Company. 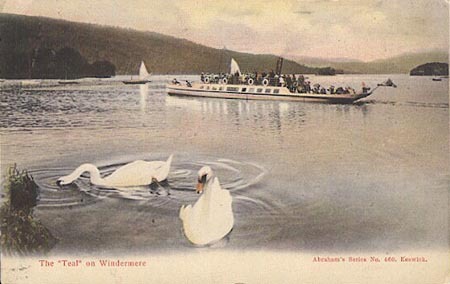 The Lakeside branch opened in 1869, and a large screw steamer, the Swan (1) was delivered the same year. Two smaller steamers followed in 1879, the Cygnet and Teal (1). 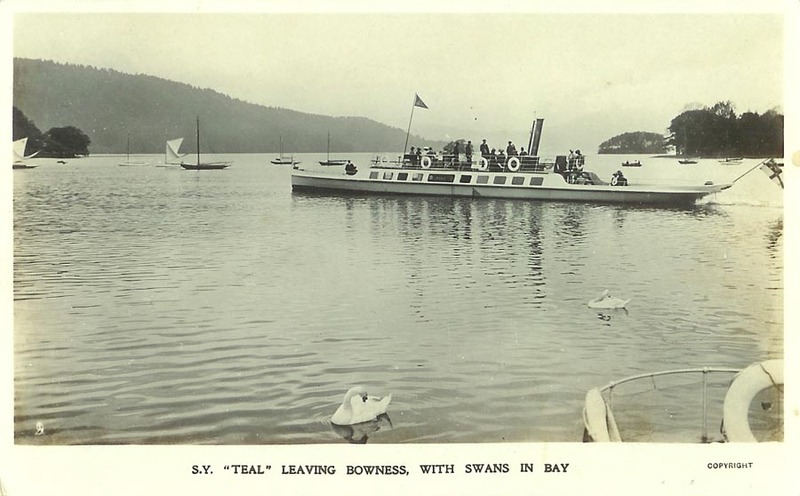 These were followed by the elegant Tern in 1890, which is still in service. 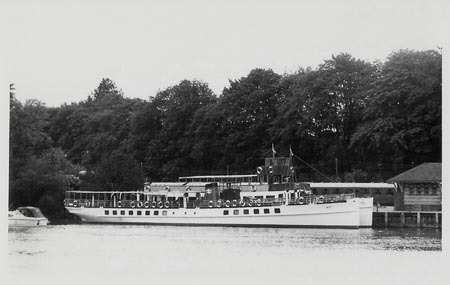 Ownership passed to the LMS in 1923, and they built two large motorships, Swan (2) and Teal (2), in 1936. Teal (1) was withdrawn in 1927, but the rest of the fleet passed to British Railways in 1948, who scrapped Cygnet in 1955. Furness Railway postcard of Cygnet and Teal (1) (Series 11). 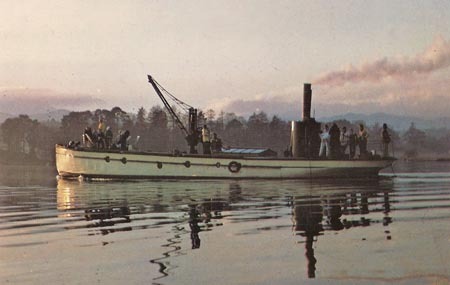 Postcard of Cygnet with black hull. 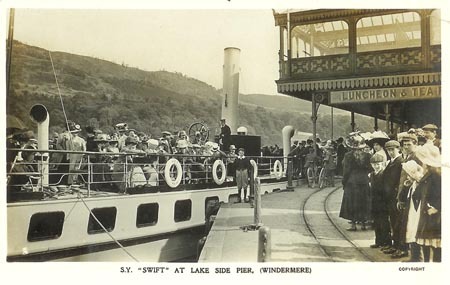 In the same year, 1866, the Furness Railway commenced construction of the Lakeside branch (now a preserved steam railway) and took control of the United Steam Yacht Company. 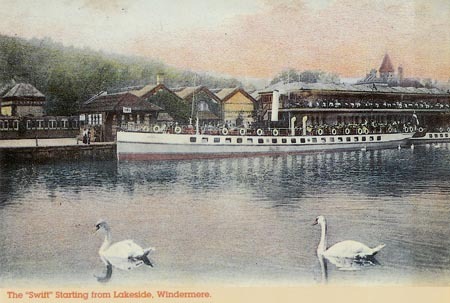 The Lakeside branch opened in 1869, and a large screw steamer, the Swan (1) was delivered the same year. 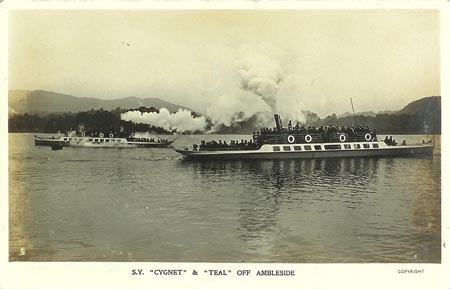 Two smaller steamers followed in 1879, the Cygnet and Teal (1). These were followed by the elegant Tern in 1890, which is still in service. 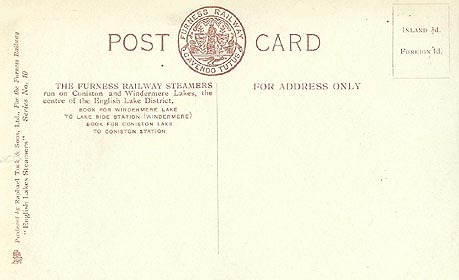 Ownership passed to the LMS in 1923, and Teal (1) was withdrawn in 1927. Furness Railway postcard of Teal (1) (Series 11). Modern postcard of Teal (1). 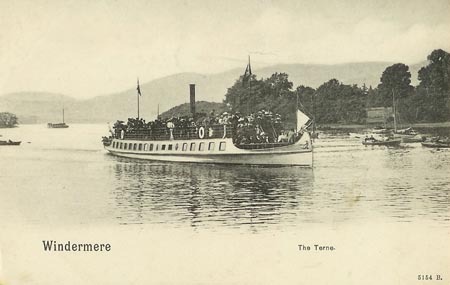 The elegant Tern was built for the Furness Railway in 1891. 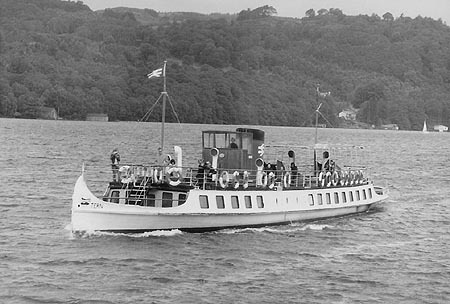 Ownership passed to the LMS in 1923, and the fleet passed to British Railways in 1948, later becoming Sealink. Sealink was privatised in 1984, being taken over by Sea Containers. Tern remains in service, with what are now known as Windermere Lake Cruises. 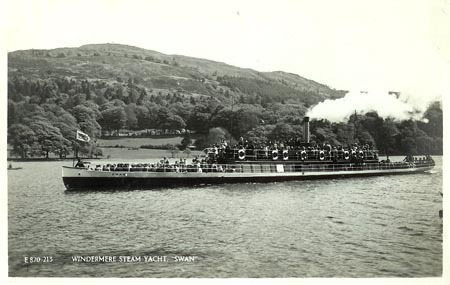 Postcard of Tern as steamship. 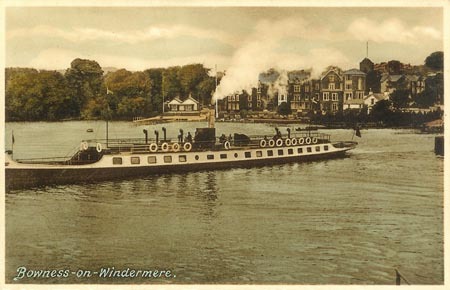 Postcard of Tern as steamship, with black hull - posted in 1929. 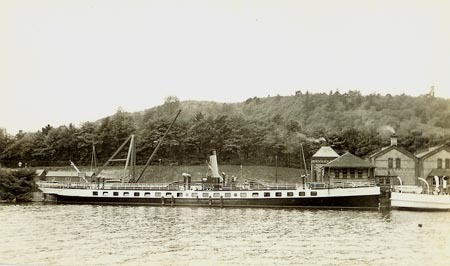 Frith postcard of Tern as steamship, with black hull. 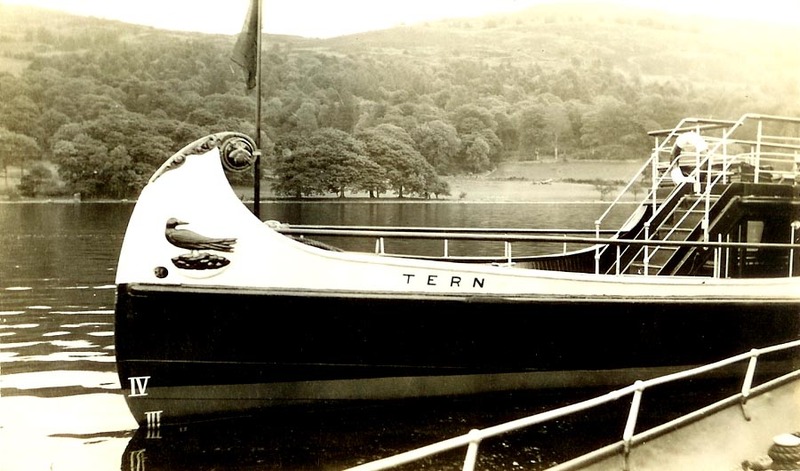 Postcard of Tern as steamship, with black hull - photographed 1939. J.Arthur Dixon postcard of Tern in British Railways colours. 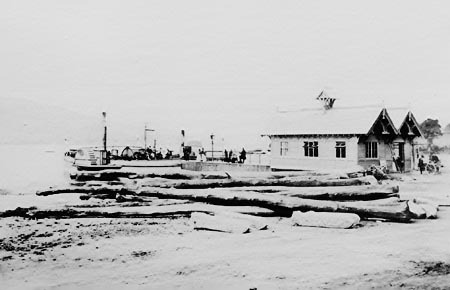 N.P.O. 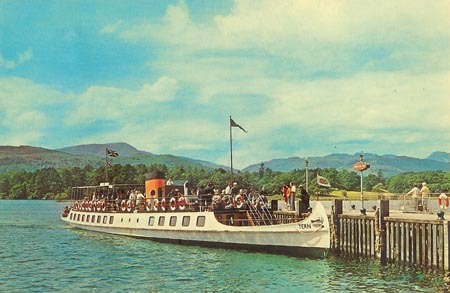 postcard of Tern in British Railways colours. British Railways multi-view postcard including Tern. 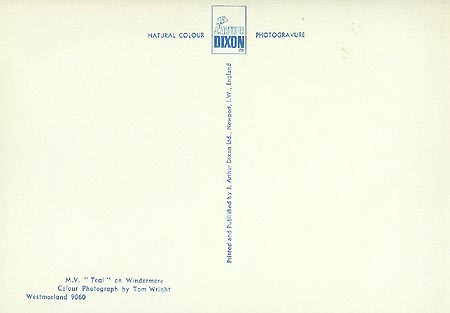 J.Arthur Dixon postcard of Tern in Sealink colours. 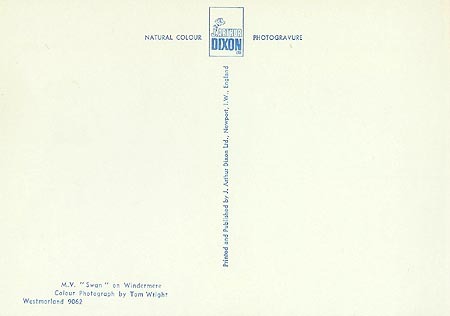 Sanderson & Dixon postcard of Tern in Sealink colours. Sealink multi-view postcard including Tern. 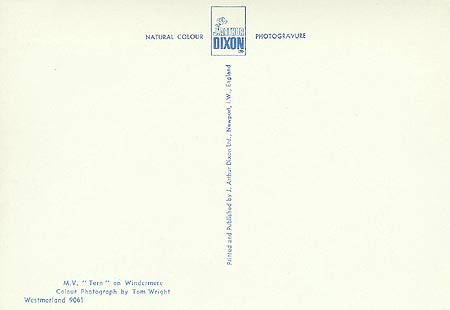 Photograph of Tern in Sealink colours. Photo: &COPY; Ian Boyle, 1975. Postcard of Tern in post-Sealink colours. The Swift was built for the Furness Railway in 1890. She was much larger than her predecessors, with a through deck from bow to stern above the saloons. 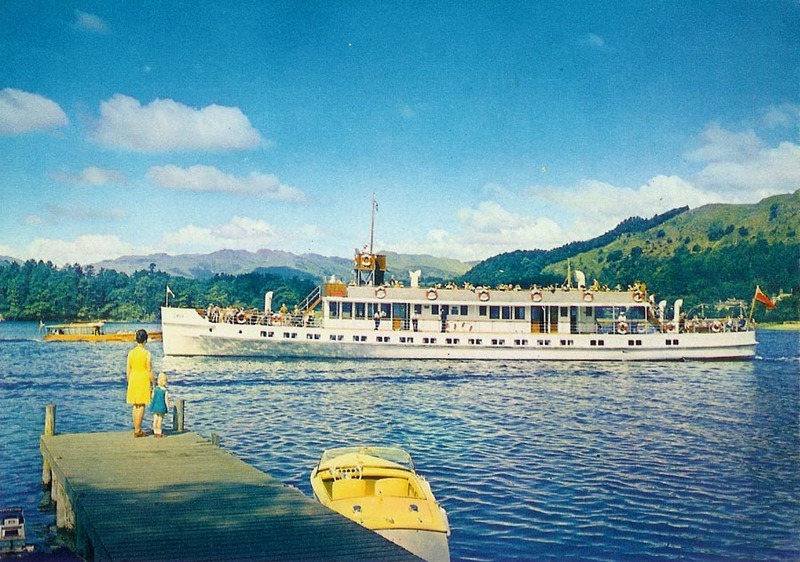 She could carry 780 passengers at 15 knots, and was powered by 4-cylinder compound engines supplied from a locomotive boiler. Ownership passed to the LMS in 1923, and they built two large motorships, Swan (2) and Teal (2), in 1936. 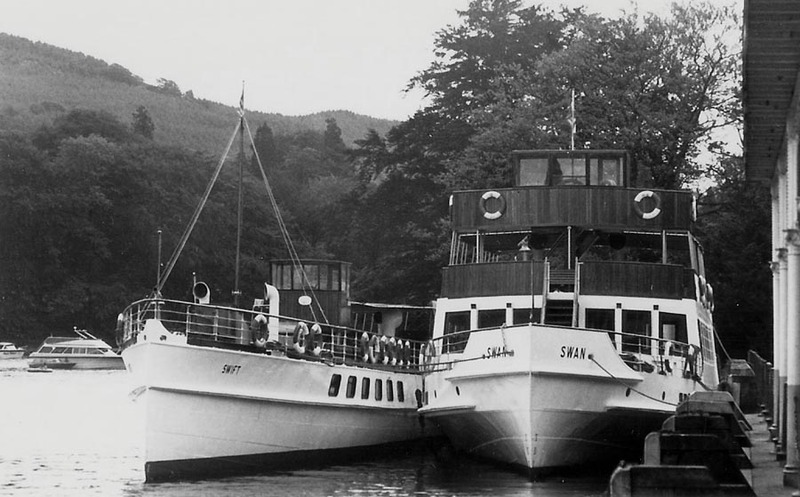 The fleet passed to British Railways in 1948, later becoming Sealink. Swift was converted to diesel propulsion in 1958. Sealink was privatised in 1984, being taken over by Sea Containers. Swift was part of the sale, but had been out of use since 1981. 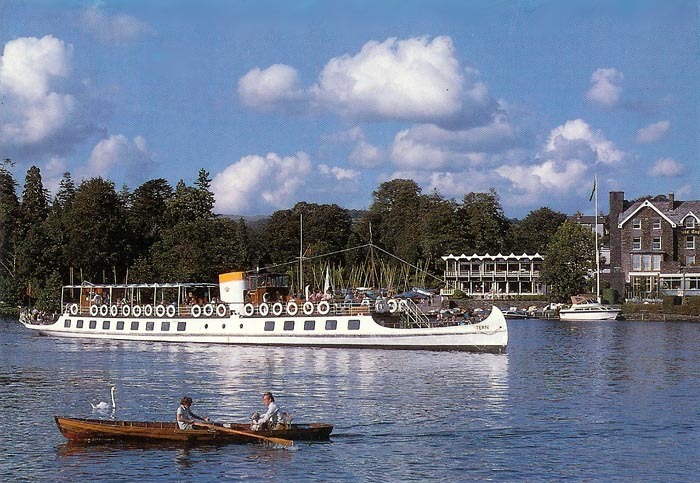 She was used for a period as floating museum devoted to the Campbell family's speed record attempts on the lake. Swift's condition deteriorated, and she was broken up in 1998, despite attempts to save her. Furness Railway postcard of Swift as a steamship (Series 10). 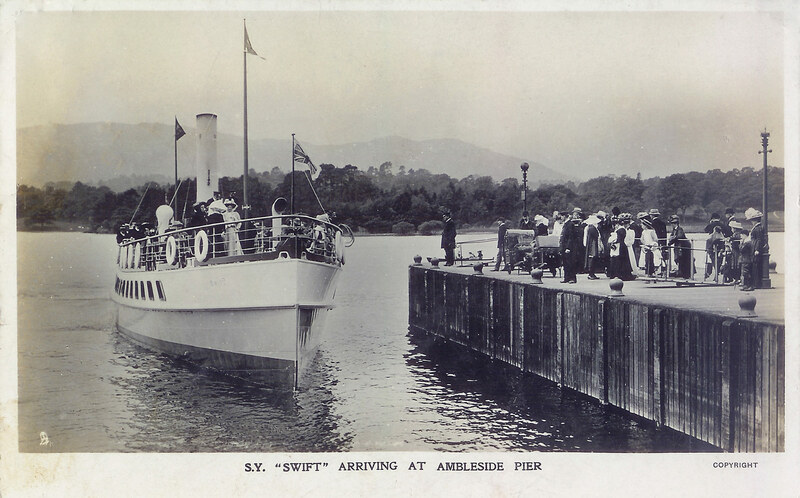 Postcard of Swift as a steamship - note White Ensign flying (alternative copy of the card above). Postcard of Swift as a steamship - posted 15th August 1910. Postcard of Swift as a steamship - note White Ensign flying. 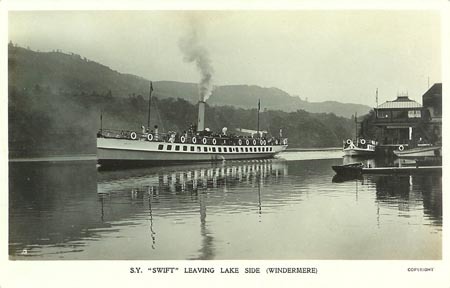 Postcard of Swift as a steamship. Postcard of Swift as a steamship - black funnel top. RA Series postcard of Swift as a steamship - black funnel top. 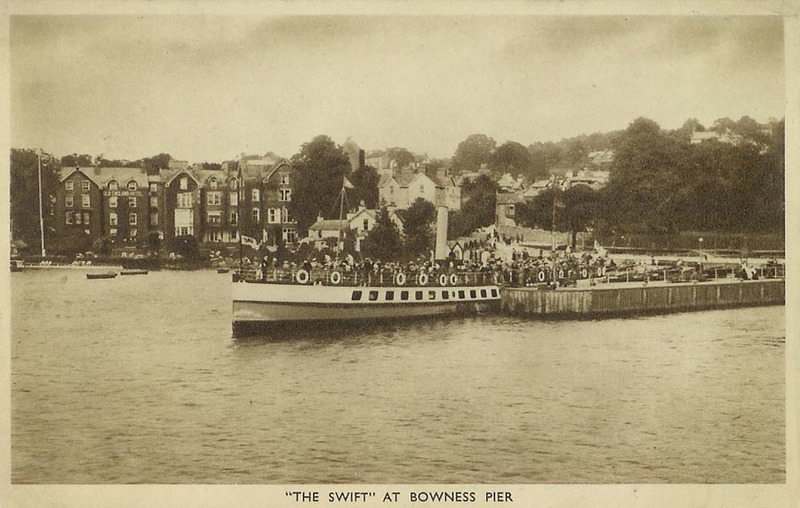 Postcard of Swift as a steamship - with black hull and black funnel top - posted 15th August 1910. 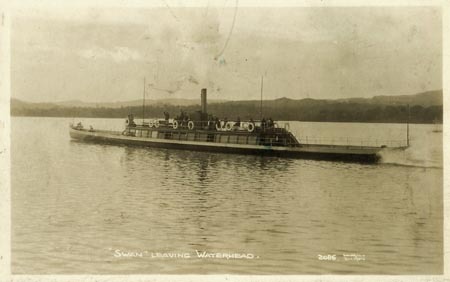 Postcard of Swift as a steamship - with black hull and black funnel top. 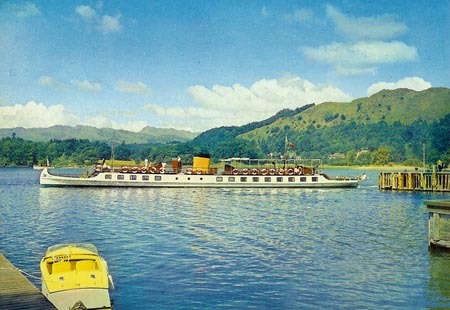 Postcard of Swift in British Railways colours. 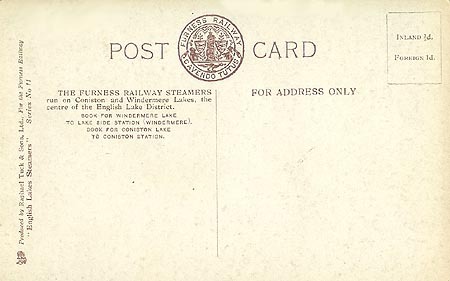 British Railways multi-view postcard including Swift. 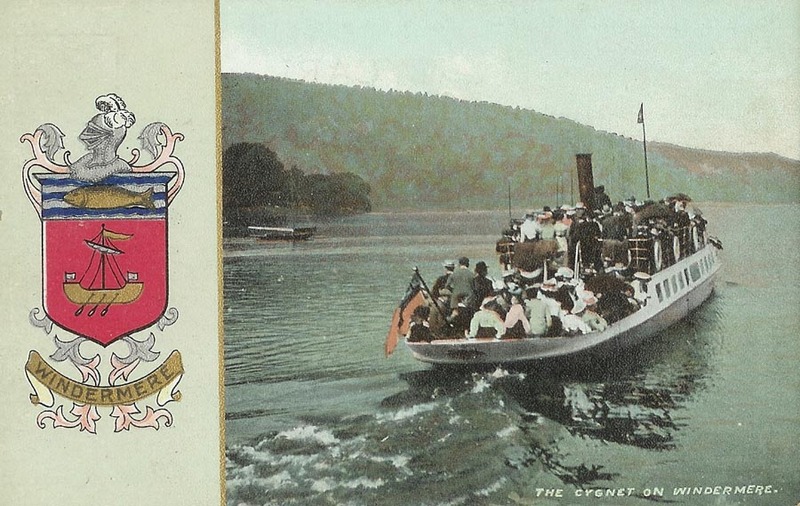 J.Arthur Dixon postcard of Swift in Sealink colours. Sealink multi-view postcard including Swift. Photograph of Swift and Swan in Sealink service at Lakeside. 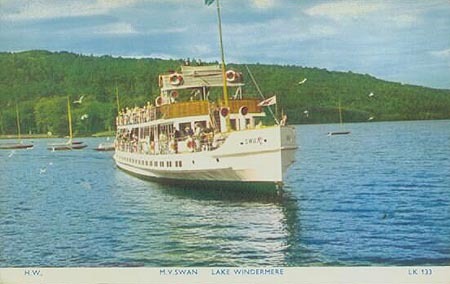 Postcard of Teal (2) or Swan (2) at Lakeside from the deck of Swift. Britannia was built in 1879 as a yacht for Colonel G.J.M.Ridehalgh of Fell Foot, near Lakeside, at the then enormous cost of £12000. 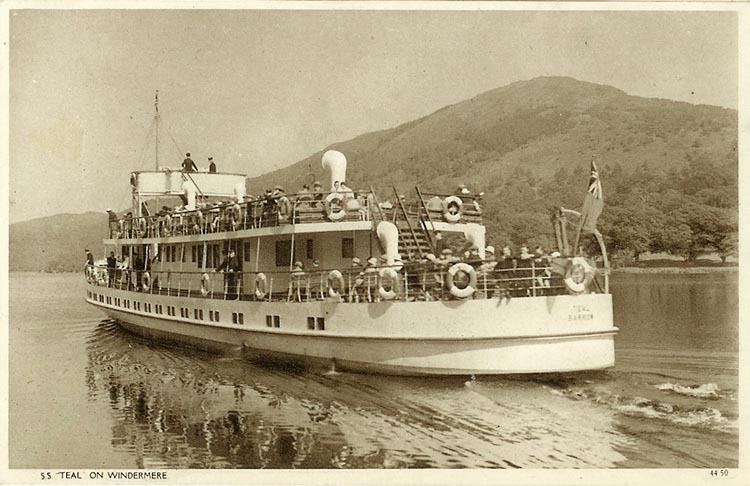 She was sold to the Furness railway in 1908 for a mere £550, and used as a director's yacht and private-hire steamer. 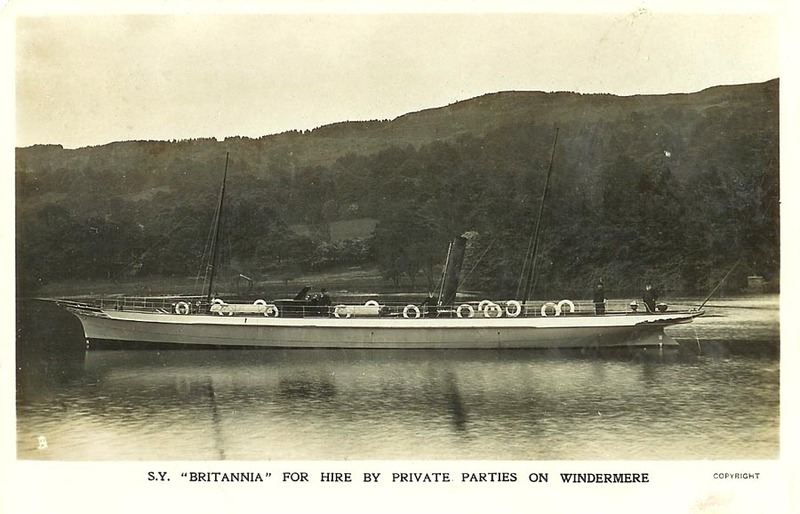 Britannia was withdrawn and scrapped in 1918. 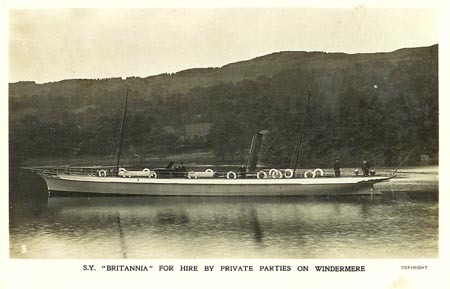 Furness Railway postcard of Britannia. Ownership of Windermere steamers passed to the LMS in 1923, and they built two large motorships, Swan (2) and Teal (2), in 1936. 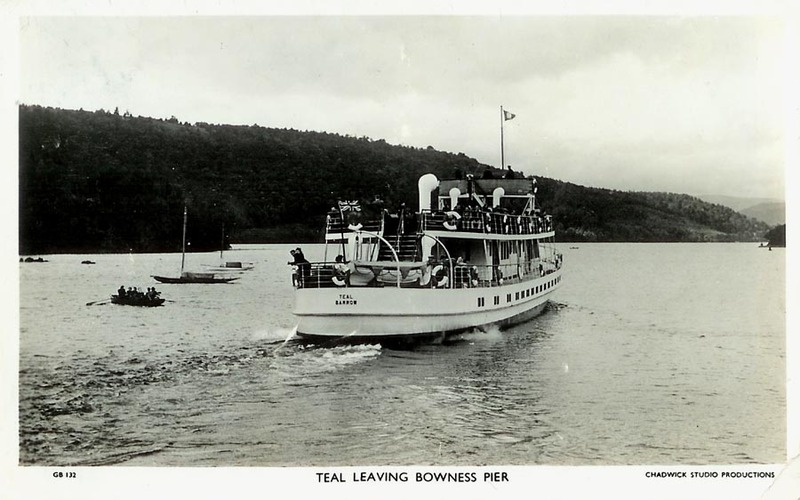 Teal (1) was withdrawn in 1927, but the rest of the fleet passed to British Railways in 1948, later becoming Sealink. Sealink was privatised in 1984, being taken over by Sea Containers. 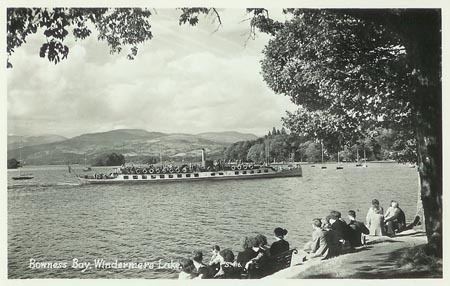 Swan (2) remains in service, with what are now known as Windermere Lake Cruises. 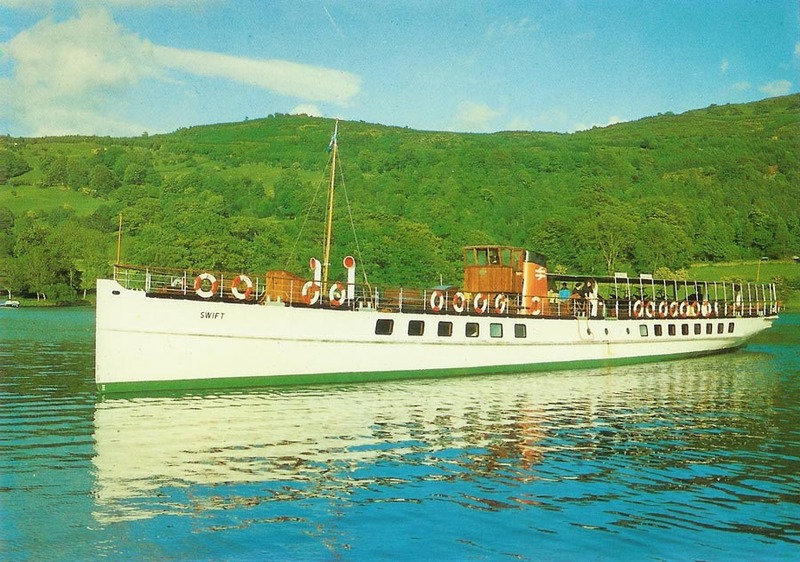 Accommodation on the sisters has been upgraded over the years, initially with a lightweight top deck canopy and enclosed bridge. 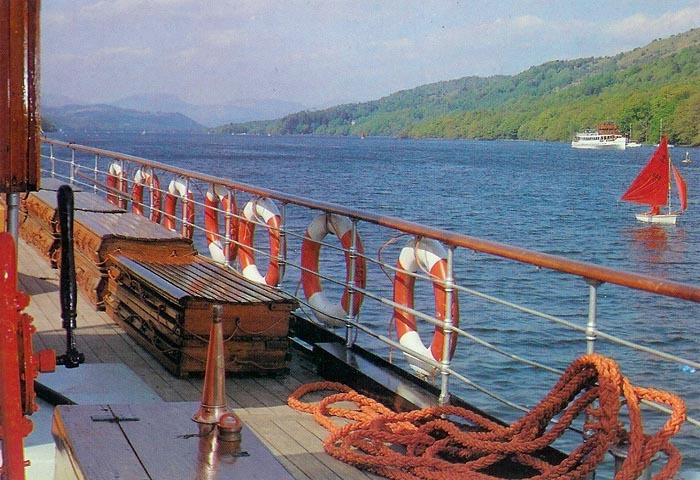 The main deck saloons were then extended to the full width of the boats. Finally, more permanent upper deck canopies were installed. 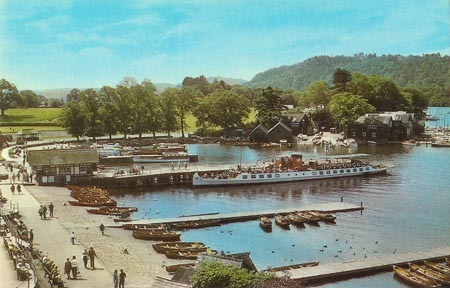 Chadwick Studio Productions photographic postcard P131 of Swan (2). 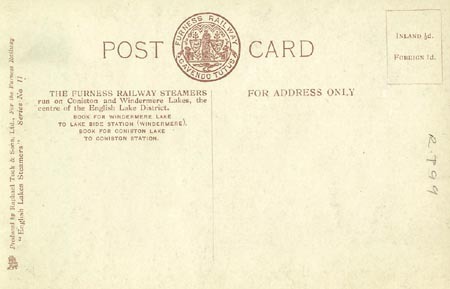 J.Arthur Dixon postcard of Swan (2) in British Railways days. 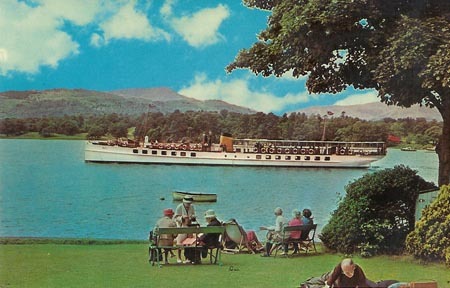 Postcard of Swan (2) in British Railways days. 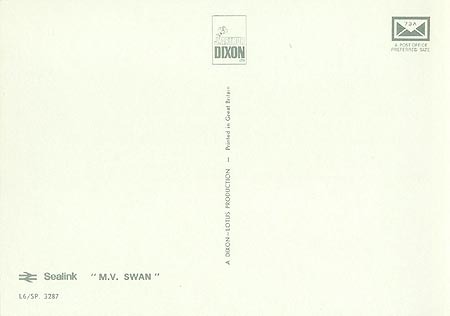 J.Arthur Dixon postcard of Swan (2) in Sealink days. 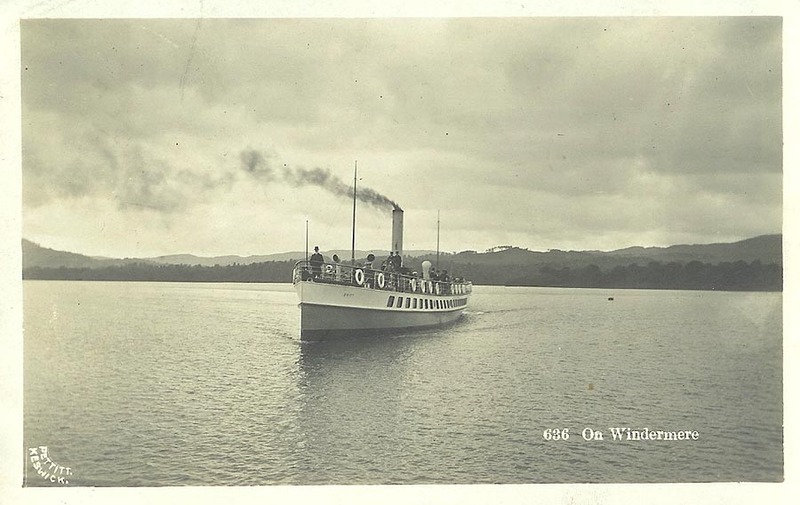 Wright postcard of Swan (2) in post-Sealink service. Postcard of Swan (2) in post-Sealink service. Ownership of Windermere steamers passed to the LMS in 1923, and they built two large motorships, Swan (2) and Teal (2), in 1936. 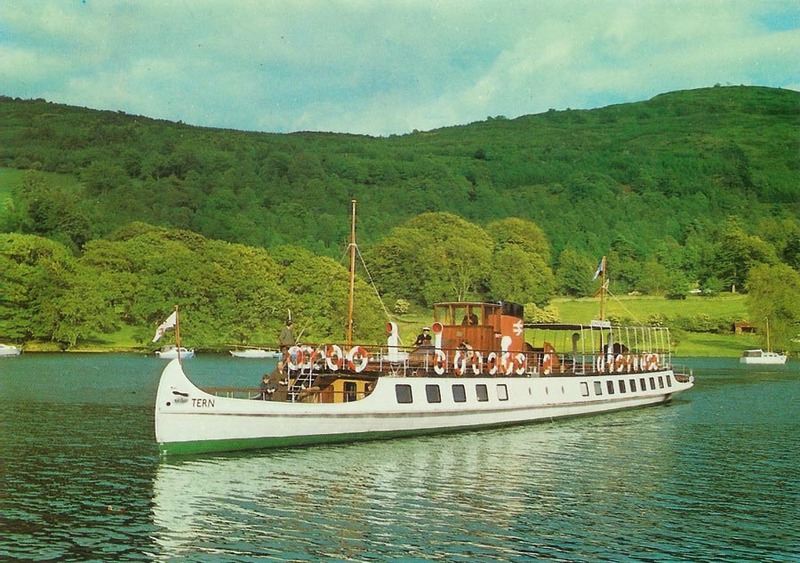 Teal (1) was withdrawn in 1927, but the rest of the fleet passed to British Railways in 1948, later becoming Sealink. Sealink was privatised in 1984, being taken over by Sea Containers. 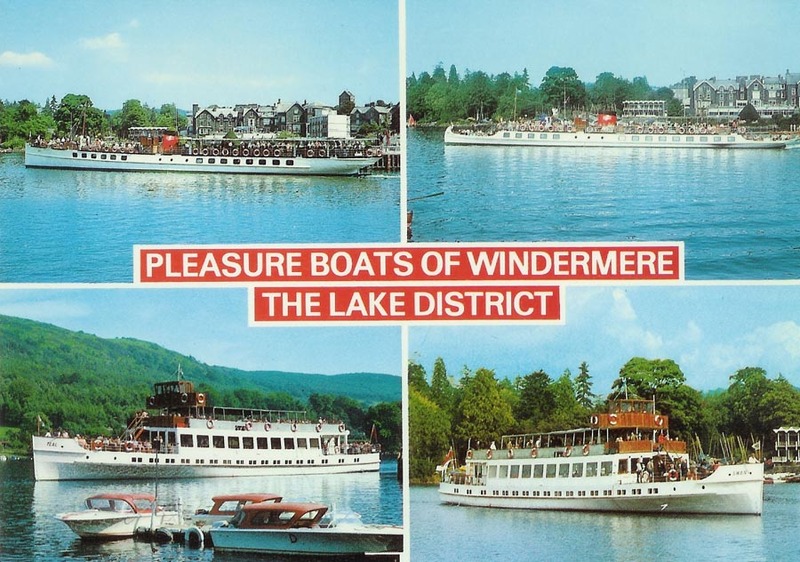 Teal (2) remains in service, with what are now known as Windermere Lake Cruises. Aero Pictorial photographic postcard of Teal (2) at Bowness. ChadwickStudio Productions photographic postcard GB132 of Teal (2) leaving Bowness. 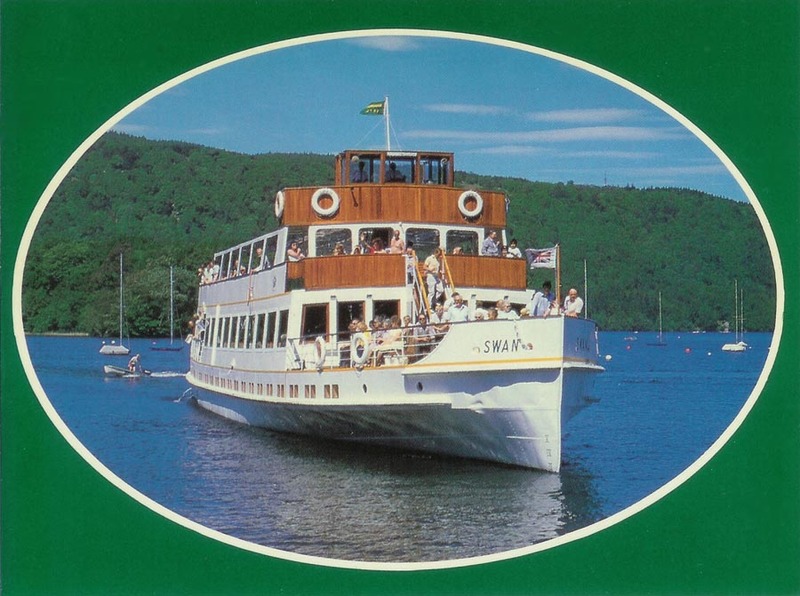 Chadwick Studio Productions postcard of Teal (2). 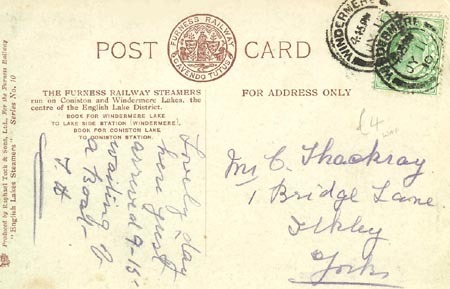 J.Arthur Dixon postcard of Teal (2) in British Railways days. 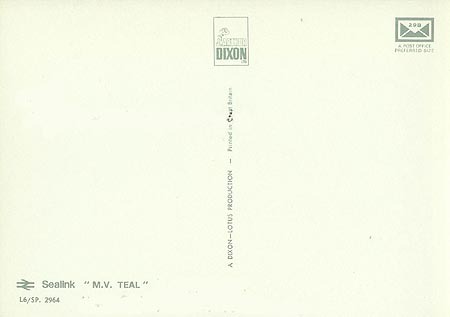 J.Arthur Dixon postcard of Teal (2) in Sealink days. Postcard of Teal (2) in post-Sealink service.